"You never did kill the Prince, Richton. He lives!" 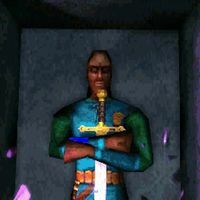 Prince A'tor was the son of High King Thassad II and heir to the Kingdom of Hammerfell. With Thassad's death, a civil war erupted between the two major factions, Crowns and Forebears. A'tor fled to Stros M'Kai when the Forebears captured Sentinel, and there he gathered his forces. The Crowns won many battles and planned to retake the capital, but the Forebears signed a treaty allying themselves with Tiber Septim and his Empire. Imperial legions and Forebears combined were no match for the Crowns. Knowing the fate of his kingdom was at stake, the Prince decided to make a last stand at Stros M'Kai. The Emperor sent Admiral Richton to conquer the island, as well as the dragon Nafaalilargus to ensure victory. A'tor commanded his fleet in the Battle of Stros M'Kai, but was shot down by Richton's assassin, Dram. His wizard, Archmage Voa, tried to save him but could only put the Prince's soul in a soul gem and his body in a stasis field. Despite the destruction of the flagship, A'tor's body was moved to land and hidden in the Temple of Arkay, while the soul gem was acquired by the Restless League. Cyrus learns about the Prince's location either from Iszara while planning to recover the soul gem, or from Brother Nidal. The priest keeps it a secret until you earn his trust by finding Kithral's journal. Having obtained the soul gem and Voa's ring, and saved Hayle's soul, you can ask Saban to restore the Prince. She performs the ritual, but A'tor's soul enchants the sword rather than his body, to the dismay of Basil and the League. Wielding the soul sword, Cyrus delivers a powerful speech, claiming the Prince chose this form to symbolize his intentions. A'tor's spirit guides Cyrus into the Palace through a secret entrance. 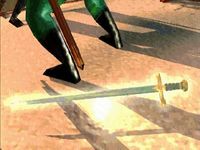 The soul sword is much stronger than your old sabre and with it, you storm the Palace and make your way up to the Dwemer airship in which Richton plans to escape. Outmatched, the Governor feigns surrender but Dram catches Cyrus off guard and holds a knife to his throat. 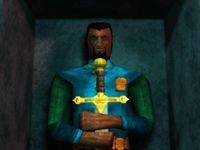 In this final moment, the soul sword rises and A'tor uses it himself to kill both Richton and Dram. Raze the Palace: Storm the Palace and kill Lord Richton. This page was last modified on 15 August 2018, at 06:51.